The Real Estate Institute in their monthly report for October stated in headlining their report that "LVR Restrictions Impacting Sales Volumes" - they went on to say "sales volumes eased back in October following the introduction by the Reserve Bank of restrictions on high LVR lending". The actual sales in October were 6,778 which was up 2% on a year ago, that month of October 2012 was up 32% on the prior October of 2011, which itself was up 28% on the prior year being 2010. So in the space of 3 years sales volumes are up 74%, in fact the level of 6,778 is the median for the past 21 years. 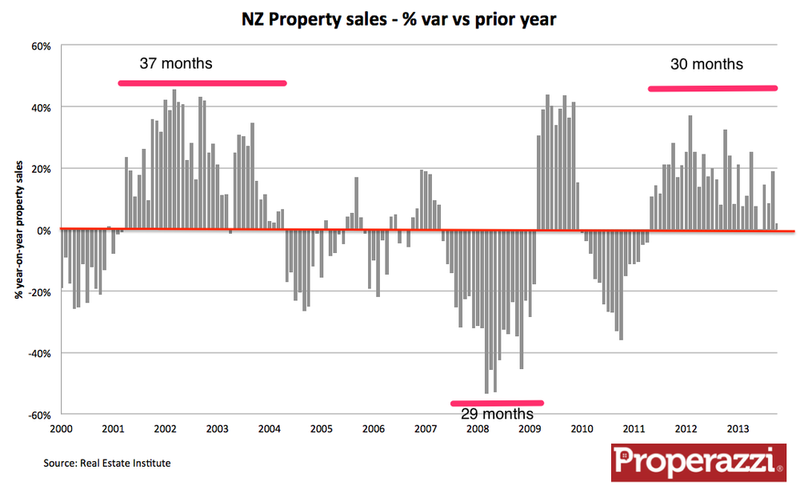 Property sales growth is slowing - looking at the trend of monthly sales as compared to prior year we are coming to the end of a run of 30 straight months of growth in sales year-on-year, by no means the longest run, but a strong recovery from the property crash of 2008 as the chart below shows. Typical towards the end of a long run of growth comes more erratic variance as the growth begins to turn negative as we are seeing in the October figures. Reading through these and the other verbatim comments reflecting a net 72% negative you would soon become depressed about the future months of property sales with a sense of up to 30% decline as that has been the often quoted component of 1st time buyers. However the reality is there is no accurate source of data that shows what 1st time buyers actually represent of the market so any prediction of effect is largely guess work, and the views of agents from what is a very small sample - just 247 from 10,000 (2.5%) should be taken with a note of caution. There is though data from the Reserve Bank that reports the weekly levels of Housing loan approvals of both new mortgages and re-mortgages. Such data provides vital opportunity for analysis as I have done in the charts below. 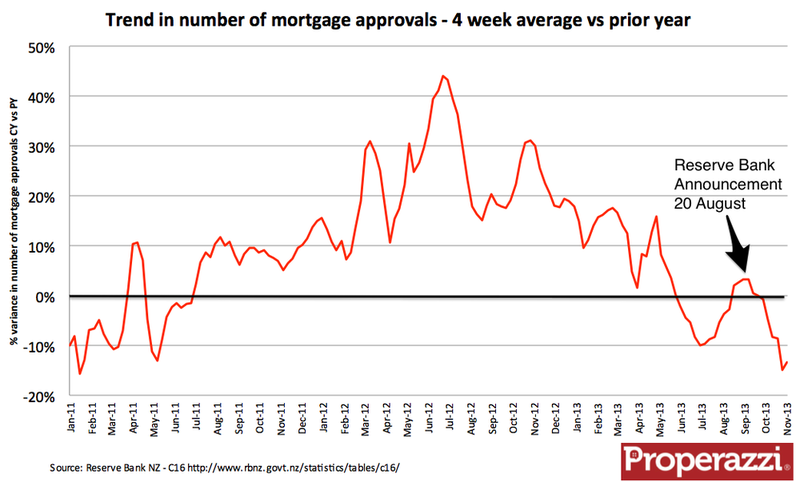 This chart shows in the red line the 4 week moving average of the number of housing loan approvals made by trading banks. The last few weeks of October certainly showed an accelerated decline, however the trend as best seen in the grey line being the 12 week moving average shows that volumes had been declining since a peak in May of this year, however they still remain around 6,000 a week. The next chart shows the trend of volume comparing the 4 week moving average year-on-year. This chart certainly would seem to show a picture of the announcement of the decision to implement the speed limit of high LVR triggering a slowing in volume of new housing loan approvals, in effect reversing a period of recovery which began in July, although as with the prior chart the longer term trend still shows slowing growth.